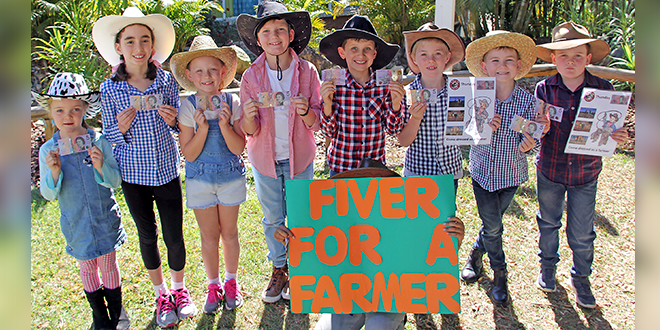 Giving Five: Students from Christ the King, Deception Bay, supported the Fiver for a Farmer campaign to raise funds for drought-stricken farmers. 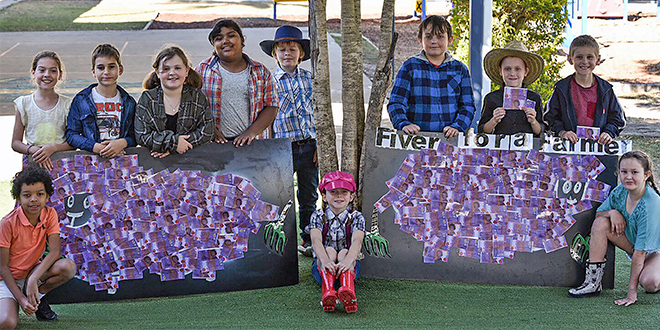 CATHOLIC schools across Brisbane archdiocese joined the Fiver for a Farmer movement to raise much-needed money to help farming families struggling through Australia’s worst drought crisis in centuries. Arriving at school dressed as farmers, students and staff came up with some novel and innovating ideas to raise awareness and money for the struggling farmers. Queensland’s Department of Agriculture and Fisheries estimated 57 per cent of the state was in drought. Fiver for a Farmer was the brainchild of 10-year-old Jack Berne, a student at St John the Baptist Primary School, at Freshwater in Sydney. His aim was to raise $20,000 which, along with his classmates, was reached in an impressive 48 hours. With the campaign going national, schools across the country came on board for the dress-like-a-farmer day. Assistant principal at All Saints School, Albany Creek, Troy Parsons said the school was eager to join the movement. Mr Parsons said the Year 3 students, with the support of their teacher, took the lead with the fundraising efforts as they were learning about how food made its way from the country to the city. He said the Year 3 students visited classrooms and promoted the “Fiver for a Farmer” Day and encouraged all students to dress up like a farmer and donate five dollars. “We have been overwhelmed by the generosity of the All Saints community,” Mr Parsons said. At Christ the King School, Deception Bay, students and staff arrived at school dressed in their best boots, jeans and “flannos”. Assistant principal for religious education Sarah McDonald said it was a fantastic sight to see. She said the Year 4 classes, with the assistance of teacher Deb Huxley, organised for two large painted sheep to be made. Ms McDonald said every student who brought in five dollars was given a pretend note to stick onto the sheep. “In total our little school of just over 250 students raised more than $1400,” she said. Families at St Joseph’s Tobruk Memorial School, Beenleigh, were also keen to participate in the fundraising efforts. Principal Tony Barron said the majority of the staff and students all dressed up for the day. He said ordinarily when the school held gold-coin fundraisers they usually raised about $300 to $400. “For our Farmer Day we raised over $1700,” he said. “This is extraordinary, considering a number of the families in our area are also doing it tough. All money raised through Fiver for a Farmer go towards the Rural Aid and Drought Angels charities.